The Chinese mainland stock markets have had a torrid two months. On 9 June MSCI, a major provider of global stock market indices, announced that this year it would not be including in its Emerging Markets Index mainland China shares (A-shares) listed in Shanghai and Shenzhen. The decision had been widely awaited and the two Chinese stock markets had rallied strongly, partly in anticipation that MSCI would say ‘yes’, which would have prompted a surge of buying from tracker funds. With hindsight – a very useful tool for investment – MSCI’s ‘no’ looks to have been the point at which Chinese investors – mainly private individuals, not institutions – took fright. 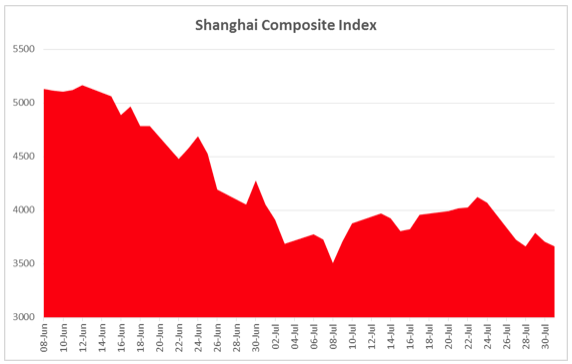 As the graph shows, the Shanghai market dropped sharply after the MSCI news and despite a few brief rallies and the best efforts of the Chinese authorities, remains down substantially from its early June peak. Whether the Chinese market is now a bargain is impossible to say. It is certainly a lot cheaper than it was two months ago. However, nobody is sure how much of the current price is built on government support and what would happen if and when that were taken away. In the longer term what is certain is that Chinese A-shares will indeed get the nod from MSCI and become an important part of the international investment scene.